I woke up early in the morning to have breakfast with Desalegn, Hileu, and Mahjeb. 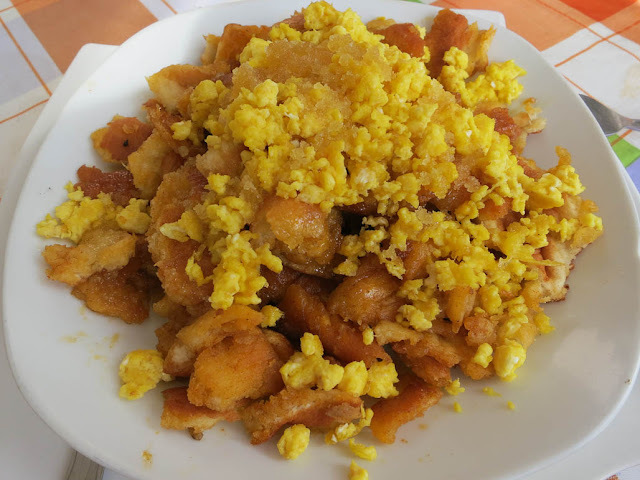 I ate chechebsa, a dish of spicy fried bread, topped with scrambled eggs and honey. The plate was huge and I got about halfway through it before I was full. The bread is spicy, the honey is sweet, and the eggs are eggs. When I was done, we got in the truck to meet Ebisa, a local beekeeper who lived 4km out of town and had agreed to show me his hives. Parking on the side of the road in front of his house, we got out and he guided us to his potato field in back. 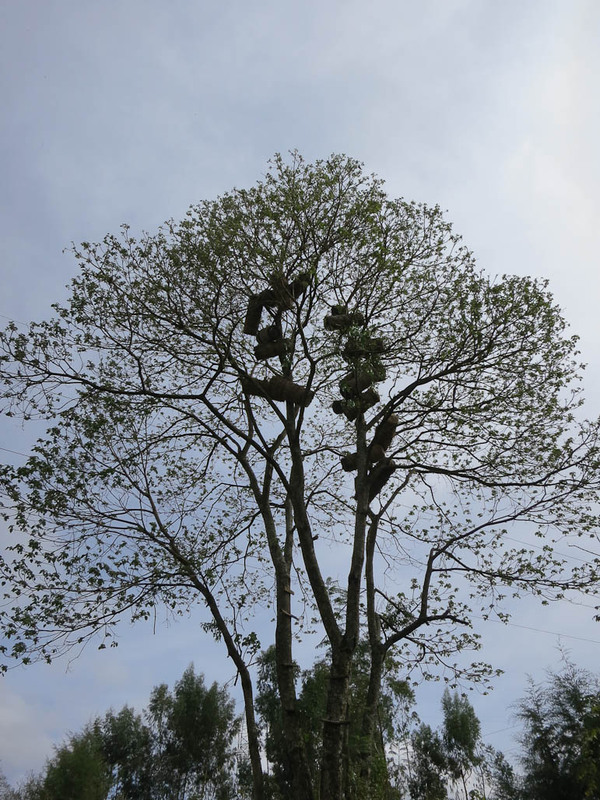 On the way, he pointed up and I saw that the trees were full of traditional hives. 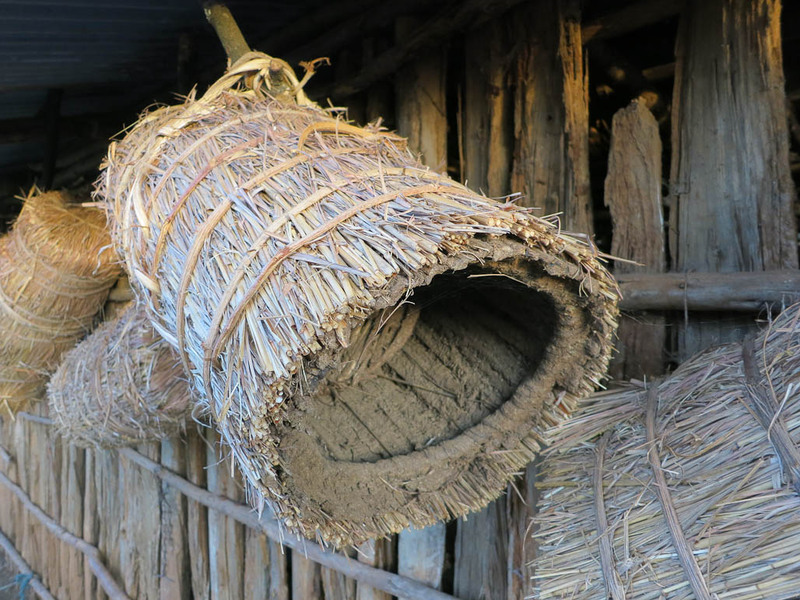 They’re shaped like cylinders made of thatch or reeds, with one closed end and a loosely fitted lid on the other. 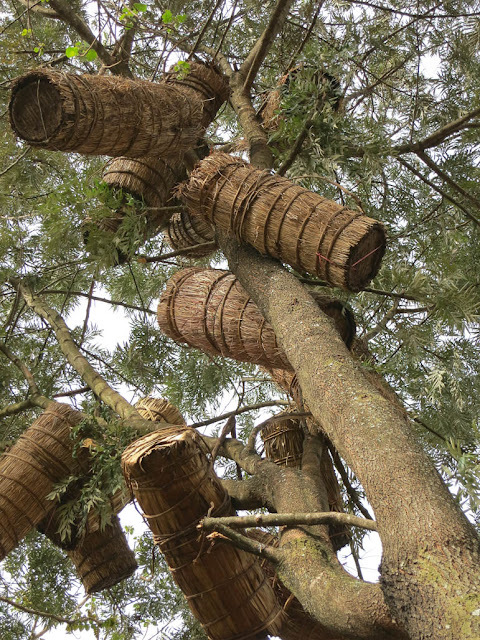 Ethiopians hang them in trees using forked branches and to harvest honey, pass them down to an assistant using a ladder. It seems a bit precarious to me, but it is the way it has been for generations and it works. Many bees in a tree. Keeping this high minimizes the number of stings on the ground. You can see the ladders nailed into the trunk. 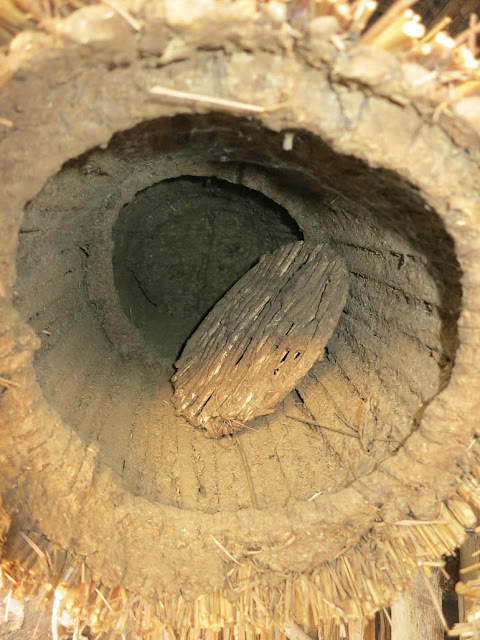 Cow dung is daubed on the inside to seal the cracks. 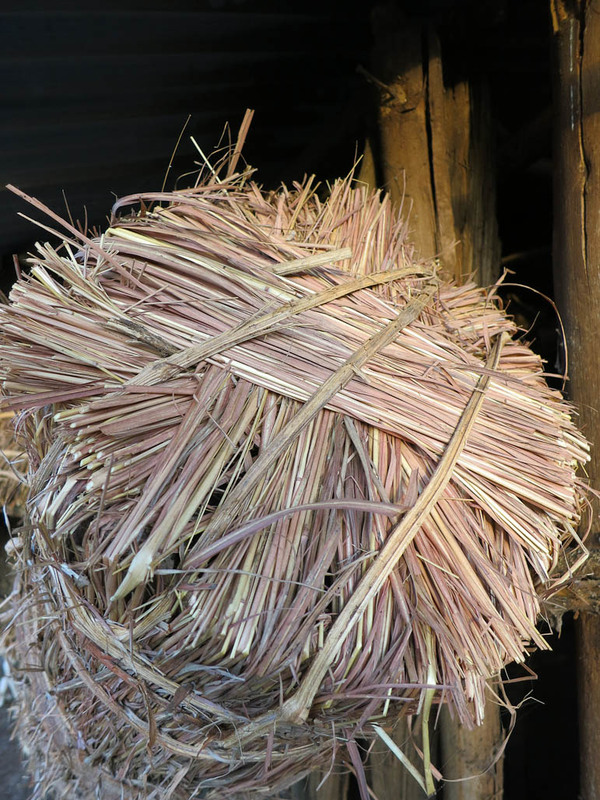 The reeds are tied around bent wooden loops to make the cylinder. And reeds are staggered and tied over the ends. In back was his bee house, a thatched building with no sides, filled with top bar and framed hives. The local variant of the basic Langstroth design is called the Zander hive, and it looks something like a pagoda. Each super has a lip on the bottom which extends over the top of the hive body below. It makes the hives very sturdy, but it is harder to get a hive tool in to open them up. Ebisa warned me not to get too close when it was light out. The bees here are very defensive and will try to sting you if you get closer than 20-30 feet from the hive. I resigned myself to taking pictures from afar until later. The bee house, from a distance. 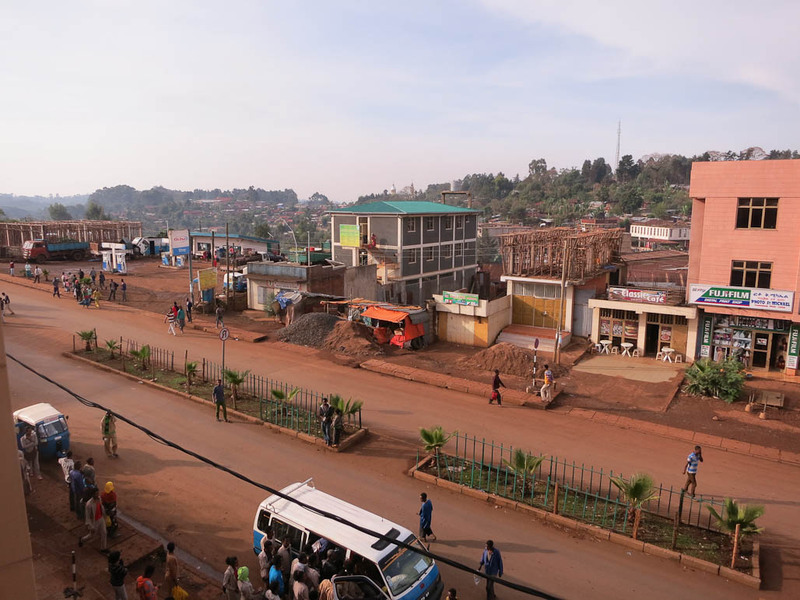 From there, we drove into town to meet the trainees and start teaching. 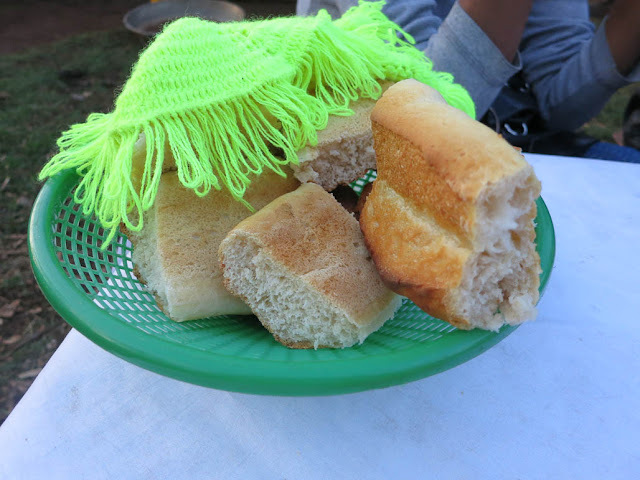 When we arrived, a representative from the Ministry of Agriculture had just finished speaking and the group was taking morning shai (tea) with sugar and vanilla cake. 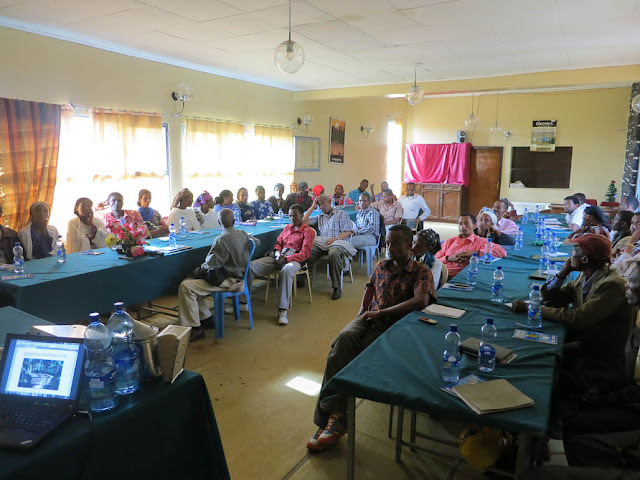 When they were done, we walked back into the conference hall and I began to tell them about current bee science, the biology of the hive as a superorganism, bee social structure and communication. People were particularly interested in the dances of the bees and how much information can be shared through the hive. We broke for lunch about halfway through and went back to lecturing and answering questions after we had enjoyed some sustenance. 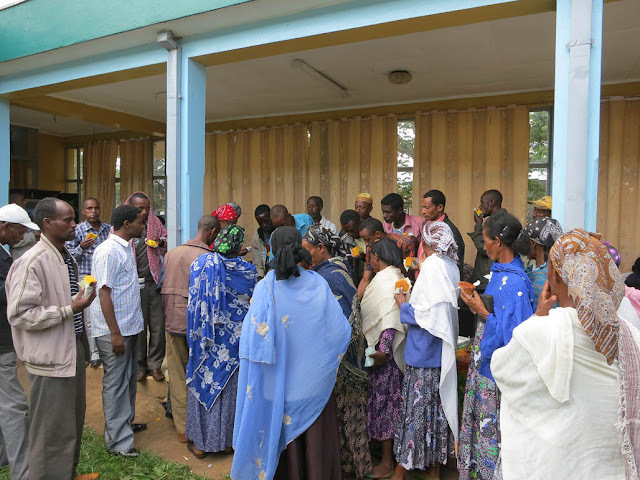 Back in the hall, I finished my talk about bee social structure and we moved on to the construction of top bar hives, which are referred to as ‘transitional’ hives in Ethiopia. Where lumber is available, most hives are constructed from the scraps and scavenged wood. For people from places where cut lumber is rare or expensive, as in rural areas, I shared pictures and construction methods for building top bar hives out of bamboo, reeds, or even wicker. We paused for a tea break in the mid-afternoon and continued talking about how to make top bars the proper width, and methods to create homemade starter strips of foundation to help the bees to build straight and moveable comb. The group of trainees. Some came from as far as 100km away. Several people had questions about and experiences with the bees in top bar hives building cross comb, turning a movable frame hive into an oversized and uninspectable traditional hive with fancy woodwork. To help them with these issues, we reiterated the importance of having top bars with the correct width of 32mm. An easy way to measure for top bars is to use a metal bottle top from a bottle of cola or mineral water. They are almost exactly 32mm wide and are commonly available, even in rural areas. I also explained the importance of having a good comb guide for the bees to follow, made either of wax or a wedge of wood. 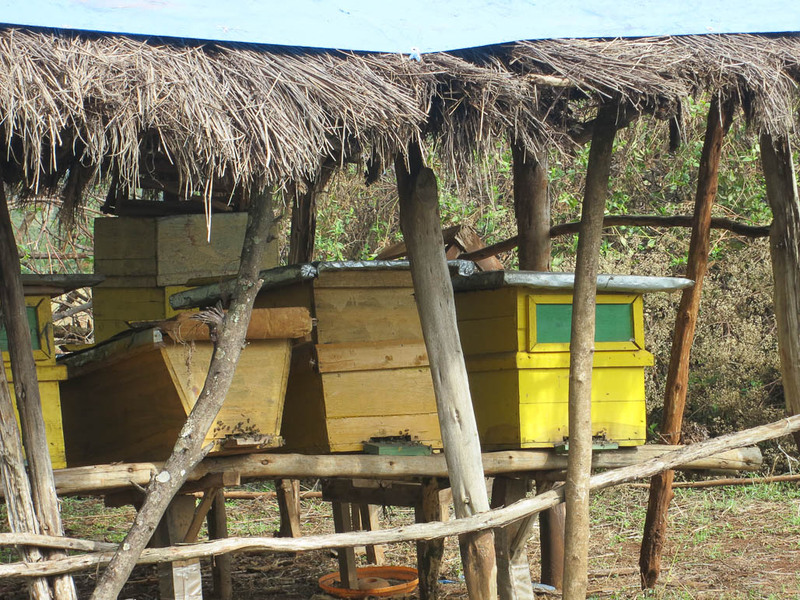 Many people with top bar hives provided by the government have been putting in the top bars with large gaps in between them so that they can see into the hive quickly and without pulling out combs. 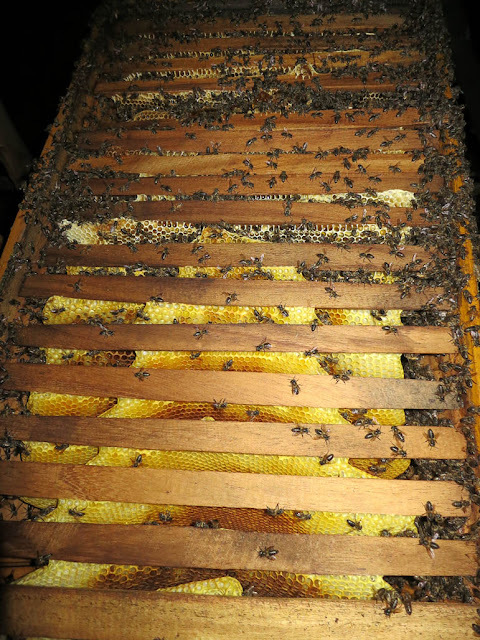 Because of this extra space, their bees have been filling the hives with brace comb, making them impossible to work. I told the trainees about the importance of maintaining proper bee space by keeping the top bars (of the proper width!) tightly together and replacing them in the same order they were removed. We finished for the day at 5 and took a short break. 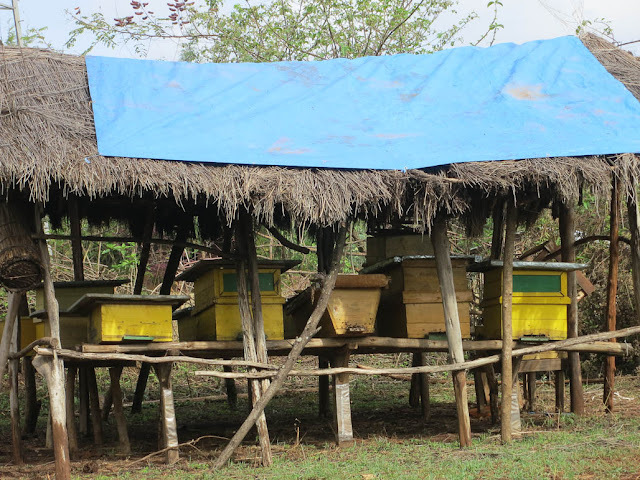 At 6, we headed back to Ebisa’s house so that I could do my first hive inspection with African bees. In this region, it is customary for the beekeeper to only work with his (or her) bees after dark. Their belief is that the bees are much more aggressive during the day, and they have a point. When it is light out, the bees can see them better and follow them for longer distances when they are agitated. At night, they must rely on their sense of smell alone and usually stay closer to the hive after the beekeeper has finished. When we arrived, it was still light, so we enjoyed a light meal of potatoes and bebere, the mix of spices that gives Ethiopian food its kick, in butter. For dessert, he shared with us bread and some of his own honey. It was very thick and very strong and very tasty. 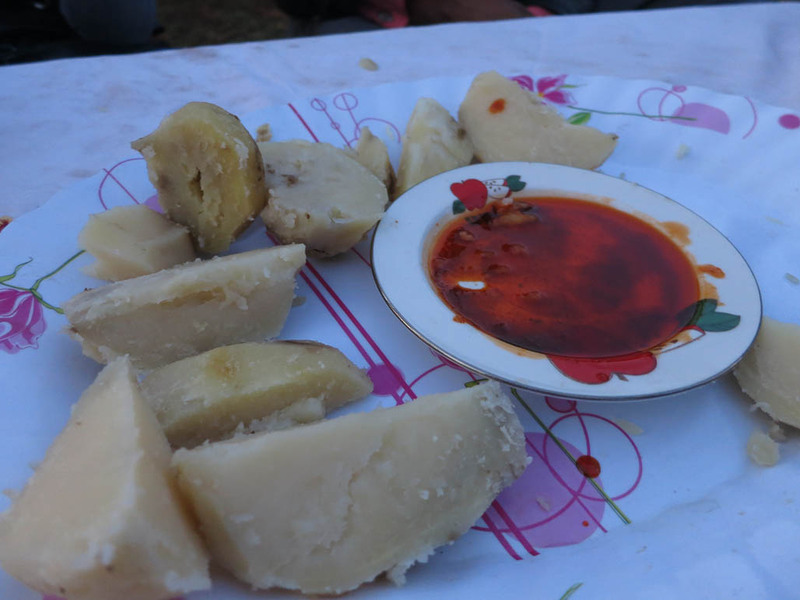 Fresh boiled potatoes and berbere in butter. Every family has it's own recipe for this mix of spices, and the taste can vary widely. Sandwiched between pieces of bread. I ate a lot of it. Soon it was after dark, and time to see the bees. I suited up and he tucked his pants into his socks and put the hood of his coat over his head. Ebisa doesn’t own a veil or gloves, so he did not wear them. When it is time to harvest, he and other local beekeepers borrow equipment from the local agricultural office on a rotating basis. Once we were protected as much as possible, we lit the smoker with hot coals from his hearth and dried cow dung to make a thick white smoke that smelled slightly sweet. 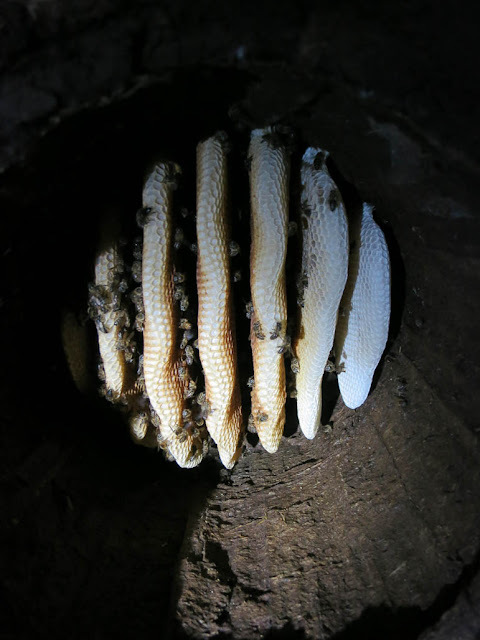 We walked over to the hives under the shelter in the darkness and used a flashlight in short bursts to open and look inside a traditional hive first. It was mostly empty and not ready for harvest, and the smoke kept the bees away from the entrance. When I looked in, I could see them running rapidly. They were tiny and dark, about half the size of my bees in NYC and much, much quicker. Tiny bees on fresh white comb being filled with nectar. After closing the hive, we moved on to a transitional, or top bar, style hive. 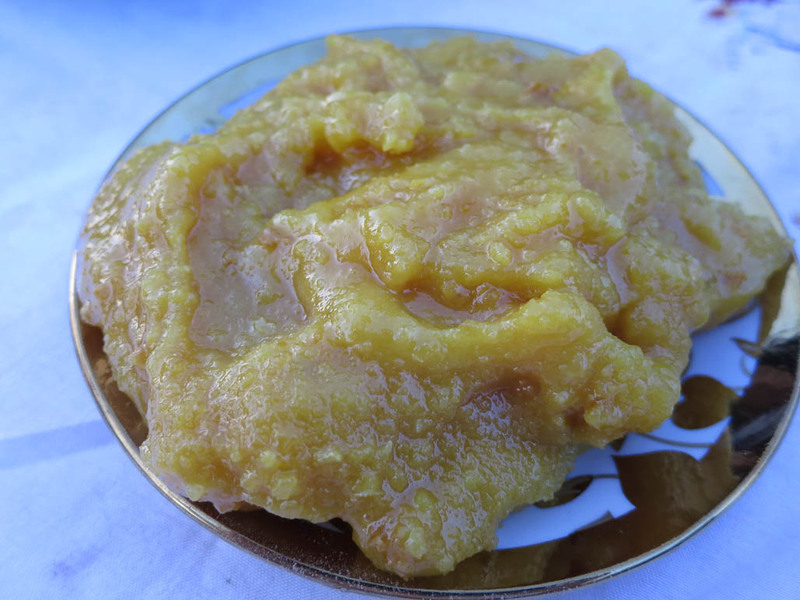 Ebisa opened the hive using my hive tool and I got my first look inside a big African beehive. It was a bit startling. As you can see, the top bars have been spaced widely, as is the common practice in this region. This allows the bees to build their comb crosswise, making the hive impossible to inspect without tearing it apart, or harvest without doing the same. More importantly, it gave the bees access to the space under the cover so that when we opened the hive, a great cloud of annoyed, tiny, fast, stinging insects flew into our face. Ebisa backed off while I took a closer look. Because I could not pull frames out without tearing the comb, I opted not to, and quickly closed up the hive after taking a few quick pictures. The frames and the combs themselves were very widely spaced, particularly considering the small size of the bees themselves. The bees tried to sting my camera. Ebisa and I moved away from the hives, and used the red light on my headlamp to look for bees clinging to us, brush them off, and smoke ourselves. To get rid of the last of the flyers, we walked through the leaves of several small trees on the way to the house, where we took off our protective gear and cooled down. He showed me the two stings he had received, one on his ankle and another under his arm, through a hole in his coat. I was honestly surprised that he didn’t get more. As a thank you for showing me his hives, I gave him the hive tool donated by Dadant. We piled back into the truck and when I got back to my room, I found that the water had been turned back on, so I flipped on the water heater in the room and enjoyed a steaming hot shower and shave. All of this is astonishing do you think there will be any changes to bee practice. Tradition is the enemy of progress, progress is the enemy of tradition.